The Morning Star Singers is a group of volunteer singers who offer songs of healing and comfort to those struggling with living or dying. 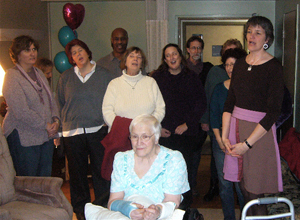 We sing for free at hospices, hospitals, nursing homes, and private homes within the Twin Cities. We are women and men from many walks of life including stay-at-home mom, librarian, urgent care physician, engineer, information technology planner, hospice nurse, retired professor, massage therapist, spiritual director, and photographer. Some of us are trained musicians; many are not. We were founded by Barbara McAfee whose experience of singing at the bedsides of friends and family members inspired her to offer this gift to a wider community. She leads the group with the support of several coordinators. Since its beginning in the fall of 2007, the group has fostered sister choirs in Rochester, MN, and in Winona, MN. We open to new members from time to time. We ask that you be able to sing in tune, follow our guidelines for being with clients, come to rehearsals as often as possible, learn our repertoire of songs, and cultivate compassionate presence. Reading music is not necessary as we learn songs using the oral tradition. Practice CD’s and lyric sheets are available to support learning between our twice-monthly rehearsals (one Tuesday and one Thursday per month). Please contact Barbara for more information. We bring a repertoire of diverse songs from many traditions to people in private homes, hospices, nursing homes, and hospitals. The spirit of the music ranges from gentle and soothing to uplifting and lively. We strive to bring music and a presence that honors the situation and preferences of each client. Though we hold our work sacred, we do not adhere to a particular religious tradition. Most visits include 4 to 6 singers and are likely to last about 15 to 20 minutes. Singers are available at various times of day and evening. We sing for those who are awake and snapping their fingers as well as those who are traveling their last few hours in silence and stillness. Please email us at morningstarsingers@gmail.com. One of our coordinators will get back to you to learn more about the person for whom we are singing. We will do all we can to match the music with his or her situation and beliefs. Our singers are available during the day and evening, seven days per week. Most visits will include 4 to 6 singers who will sing about 15 to 20 minutes.